When the starting gate of 2019 burst open, the Placement Program was off and running! 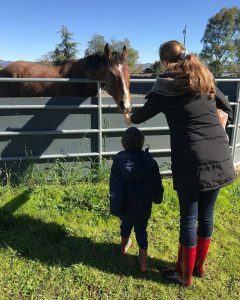 For the first quarter of this year, we have successfully placed 12 retired racehorses into their new homes with aftercare charities specializing in Thoroughbreds. Some of these horses are receiving training for their second careers and are available for adoption. You may remember Bourbon Dude by his striking roman nose and dark bay coat. We always thought he should’ve been cast as a Ring Wraith’s horse from Lord of the Rings – but that’s besides the point. 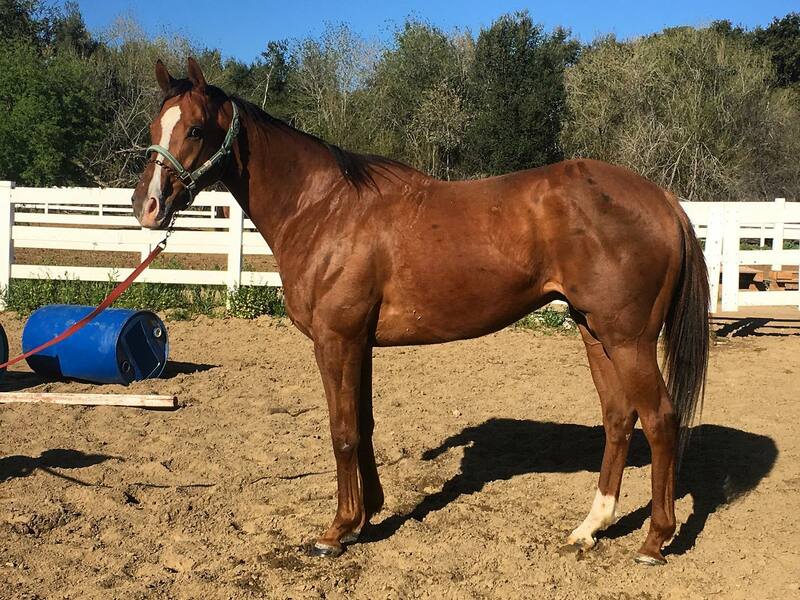 Bourbon Dude is four-year-old gelding by First Dude and is out of a More Than Ready mare. He made five starts before joining the Placement Program in July 2018. 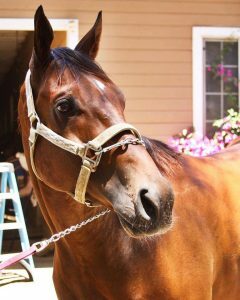 He was placed in January with aftercare charity Redwings Horse Sanctuary where he is available for adoption. Bourbon Dude is super friendly, quiet and easy-going. He is suitable for just about any equestrian discipline including: dressage, low hunters, pleasure riding and trail. If you’re looking to give back and adopt a retired racer, we highly recommend Bourbon Dude. 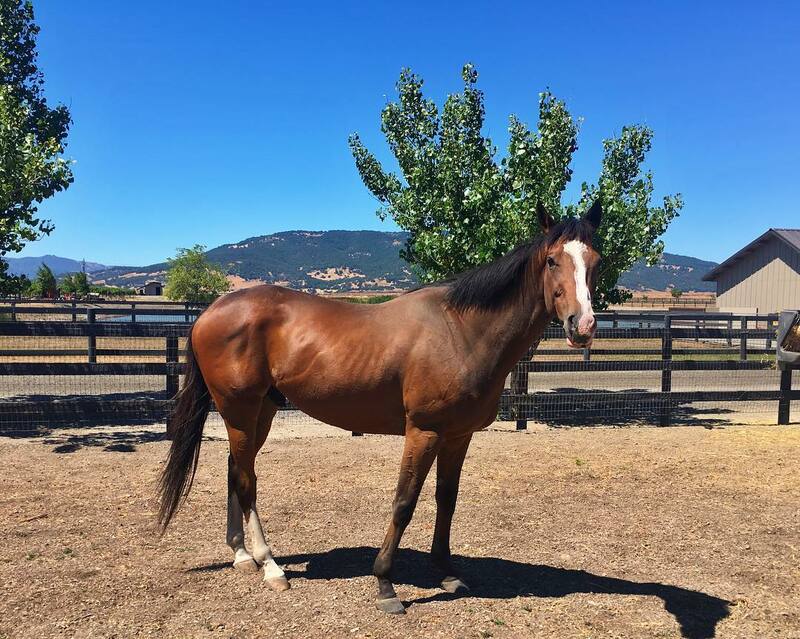 Retired by her owner and breeder due to a lack of speed and a desire for her to have a limitless second career, Fortunate Cookie joined the Placement Program in December 2018. During her time on the track, she made 10 starts and earned $15,658. 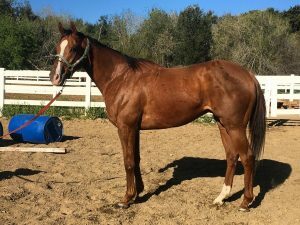 Four-year-old Fortunate Cookie was scooped up rather quickly by aftercare charity Fire and Ice - Horse Training and Rescue in January 2019, who is currently preparing her to compete in the Retired Racehorse Project this October in Kentucky. She made a special appearance at our Thoroughbred Classic Horse Show on March 23-24 where she participated in a walk trot class. 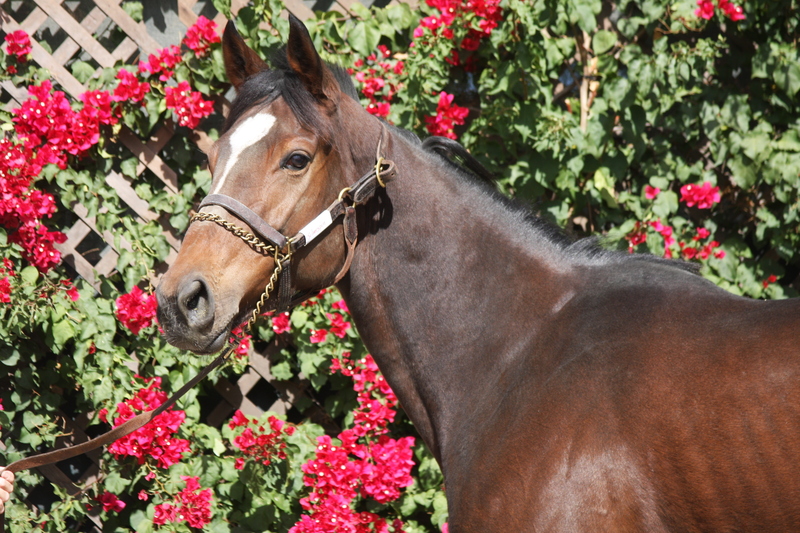 Silverspun Pickup is a 2015 filly by Papa Clem and is out of an Unusual Heat mare. In her nine career starts, she earned $70,070 and ran solely in California. 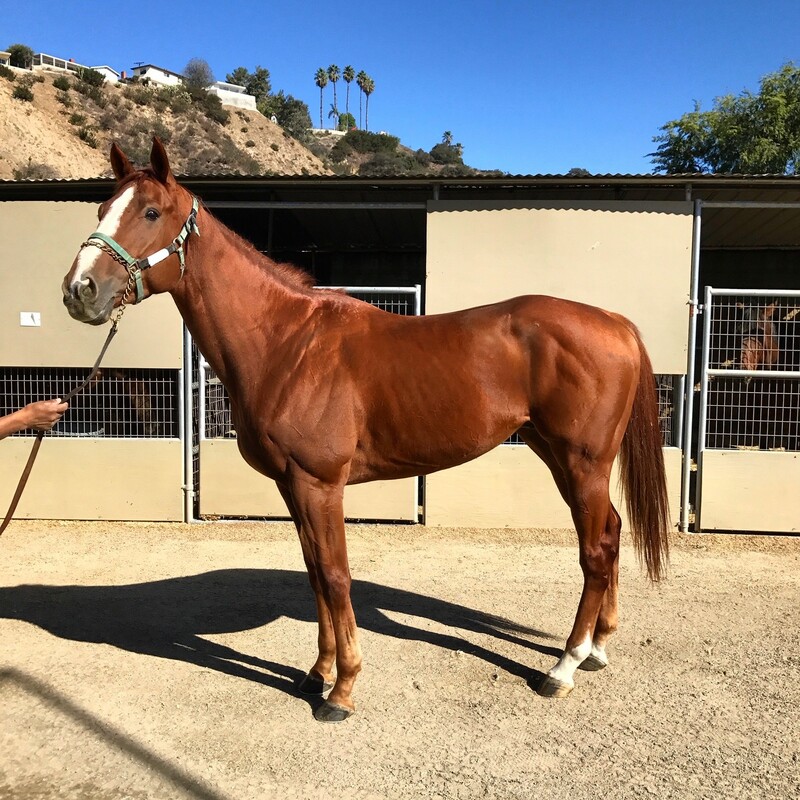 When we first met Silverspun Pickup back in August 2018 at Del Mar, we were told by her trainer that she was a bit of a stall escape artist. Well, thankfully she was unable to break out of stalls at the layup facility. Regardless, Silverspun Pickup still found ways to make things interesting. She would spin and rear in her stall (think of a spinner dolphin), hop around squealing and tease her neighbors regularly. Some personalities are too big to be contained. 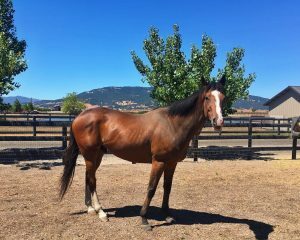 Silverspun Pickup was placed with aftercare charity Thoroughbred Rehab Center who found her a home with a large pasture in Somis, California. A handsome Irish-bred bay with chrome sired by Giant’s Causeway, need we say more? 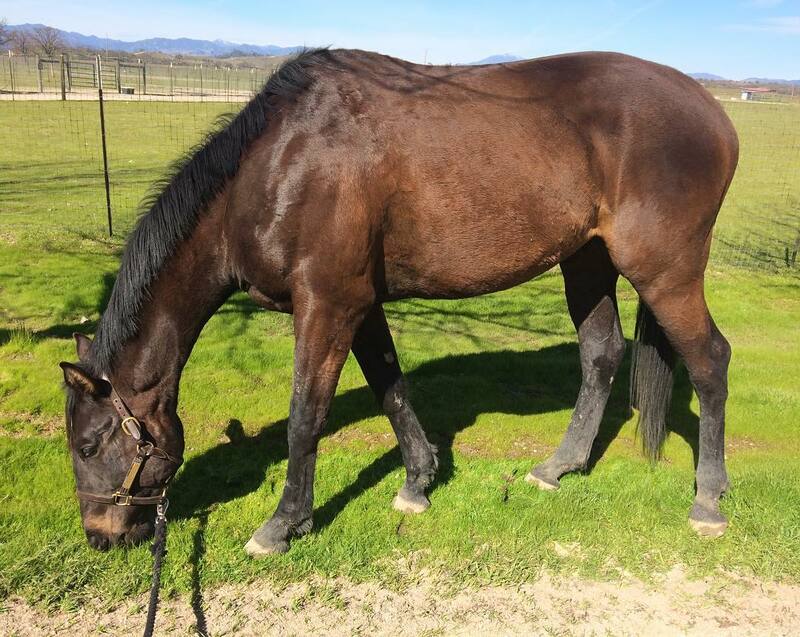 When we got the call from Malko’s owner in July 2018, she wanted him to retire him healthy so he could have a second career. Its hard to forget a flashy face like his so we remembered visiting him months before in the shed row – he rejected an apple from us at the time. During his time on the track, he raced 30 times and earned $104,425. Now seven-years-old, Malko is beginning his second career as a sport horse prospect through aftercare charity, Healing Arenas. He is available for adoption. From grooms, to assistants, to exercise riders from the early years of his racing career – everyone asked us, “How is my boy Clever Royal doing?” The eight-year-old Florida-bred gelding by Leading the Parade raced 39 times and earned $288,579 on the track before retiring to the Placement Program in May 2018. We gave him a well-deserved vacation to let down and just be a horse in pasture before rehoming him. He captured the eye of aftercare charity Square Peg Foundation in February 2019 and has become a favorite in the short months he has been there. He is great under saddle and even better making children feel special. He loves carrots and being spoiled. 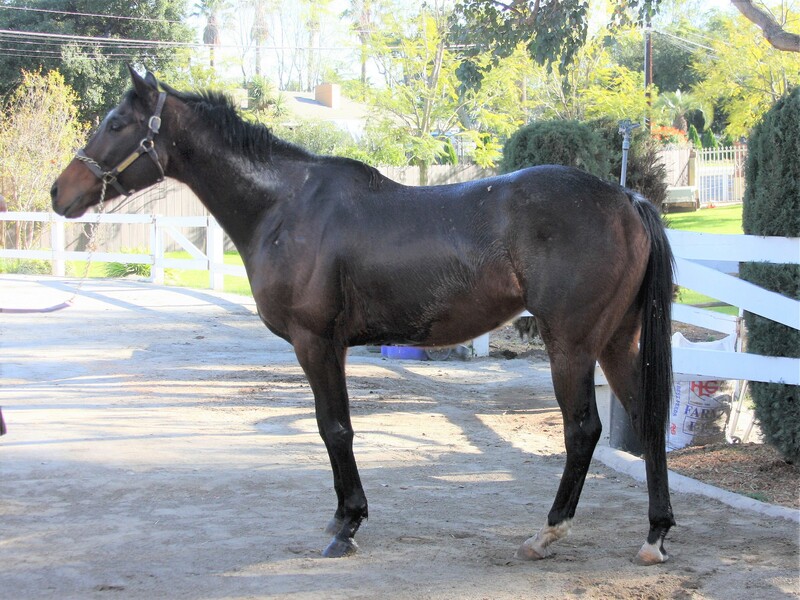 He is a handsome five-year-old gelding by Afleet Alex and is out of a Royal Academy mare. Interrogator has a big personality and captures your attention the moment you meet him. He joined the Placement Program in October 2017 after making 10 starts in his racing career. While we were searching for a riding home for Interrogator, he was in a pasture accident which change the future we had in mind for him. 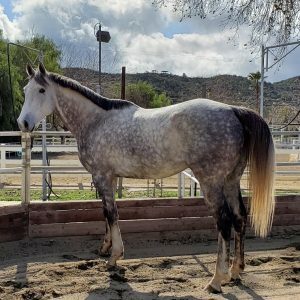 After some additional time off, he rebounded and found permanent sanctuary with aftercare charity United Pegasus Foundation in February 2019. Interrogator is looking for a sponsor to support his retirement. Photo: Win Place Home, Inc.
We were flooded with likes, comments and messages on our social media channels when Noble Nick joined the Placement Program in July 2018. With his joyful temperament, loads of presence and good looks, its easy to see why he was such a favorite. Most notably in his racing career, Noble Nick ran fourth in the 2017 Breeders’ Cup Marathon Stakes at Del Mar. Now ready to begin the next chapter of his life, he was placed with aftercare charity Win Place Home and will be available for adoption once he has started his a second career. It only took aftercare charity Thoroughbred Rehab Center one look at Closing Time’s trot to know he had a bright future as an eventing prospect. 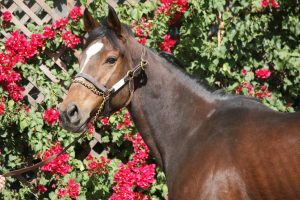 The five-year-old California-bred gelding by Slew’s Tiznow out of a Deputy Commander mare made $117,690 in 16 starts before retiring to the Placement Program in September 2018. Closing Time will be heading to his new life in Montana in a couple weeks. He was much loved home-bred for his racing connections who never got to see him compete. One minor ailment after another kept the growthy five-year-old from making it to the starting gate. 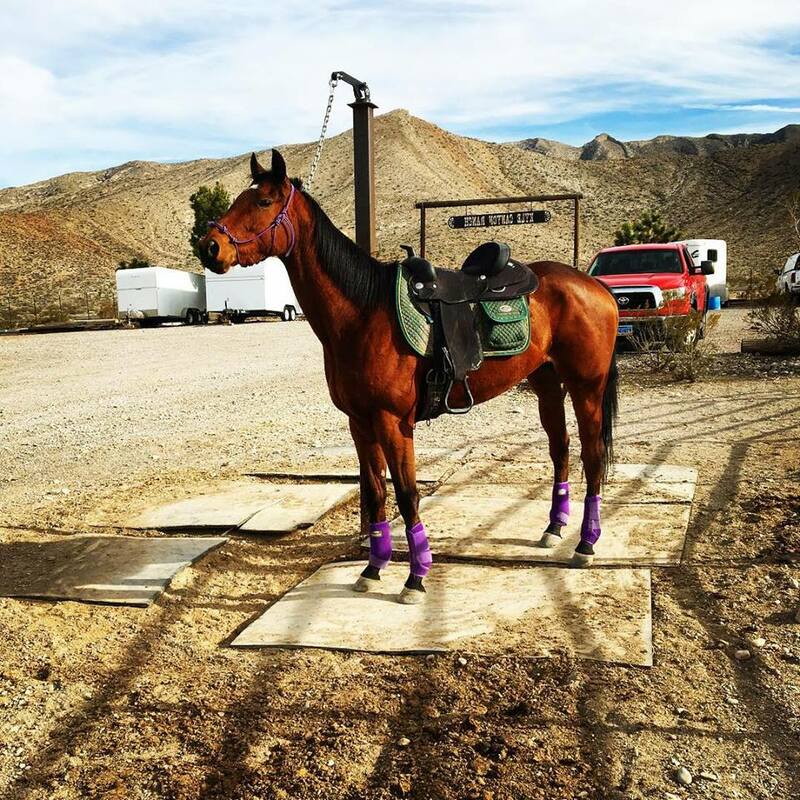 With a picture of Mr. Miyagi hanging over their mantle, his owners/breeders decided it best to retire him and change the goal to finding him a second career as a sport horse. 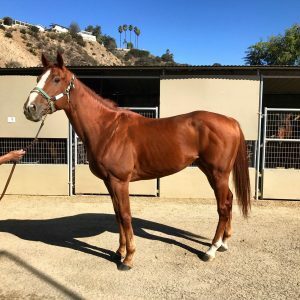 Mr. Miyagi joined the Placement Program in September 2018 and enjoyed a pasture vacation to let down from being racing fit. Aftercare charity Thoroughbred Rehab Center thought he would make a fine eventing prospect for its contacts in Montana. In case you’re wondering, yes, his owner/breeder and Thoroughbred Rehab Center have exchanged numbers and will keep in touch as Mr. Miyagi takes on eventing. 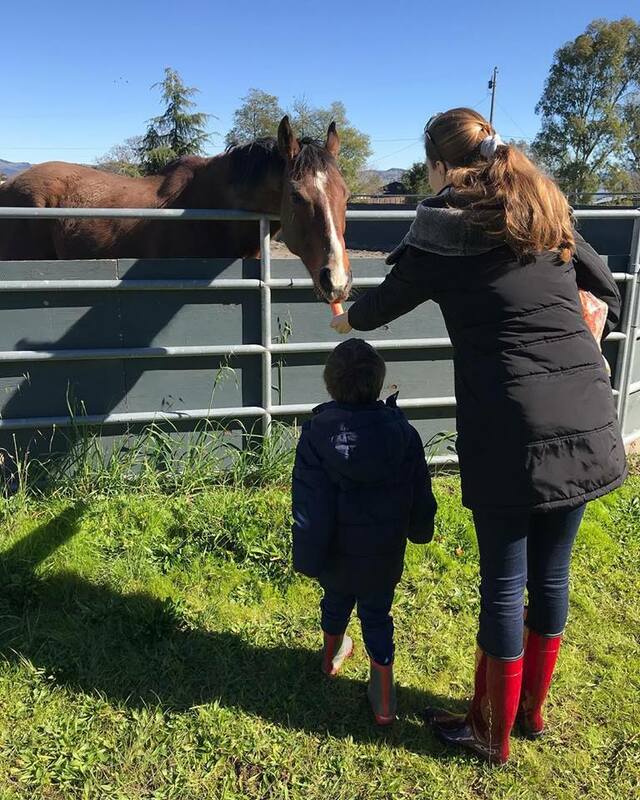 A true old soul, Mr. Zippers immediately enchanted a racing steward at Los Alamitos back in June 2018 who connected the racing connections of the seven-year-old gelding to the CARMA Placement Program. Mr. Zippers showed us all the meaning of heart, resiliency and grace as he overcame the odds throughout his rehabilitation process. He found his forever home with aftercare charity United Pegasus Foundation in March and is enjoying the spoils of sanctuary. Mr. Zippers is looking for a sponsor to help fund his retirement. Our two new retirees Home Run Kitten and Mr Zippers enjoying their first day of being in a turnout paddock. Part of the process of gradually introducing them to their forever friends in one of our many retirement herds. Anybody looking to sponsor these horses please contact us. Home Run Kitten had a very accomplished racing career during his five years on the track. He earned over half a million dollars! He competed in the Robert B. Lewis Stakes (Gr. 2), Del Mar Derby (Gr. 2), Eddie D. Stakes (Gr. 3), Breeders’ Cup Turf Sprint (Gr. 1), Mathis Brothers Mile Stakes (Gr. 2), Arcadia Stakes (Gr. 2), Frank E. Kilroe Mile Stakes (Gr. 2), San Simeon Stakes (Gr. 3), American Stakes (Gr. 3), American Stakes (Gr. 3), Shoemaker Miles Stakes (Gr. 1), Triple Bend Stakes (Gr. 1), Bing Crosby Stakes (Gr. 1), Daytona Stakes (Gr. 3) and the Pat O’Brien Stakes (Gr. 2). He was also at San Luis Rey Downs during the Lilac Fire on December 7, 2017. Home Run Kitten retired from racing in November 2018 and has taken up a permanent residency at United Pegasus Foundation. Like Interrogator and Mr. Zippers, he is looking for a sponsor. Mouthy, playful, busy and silly, Rockaway was the resident puppy of the Placement Program since he joined us in September 2018. During his racing career, he made 10 starts and earned $15,495 running at Santa Anita Park, Del Mar, Los Alamitos and Santa Rosa. Given his California boyish charm, you would be surprised to know he was actually born in Ireland. With a smart mind like Rockaway, he grew bored of his pasture vacation and joined aftercare charity Whispering Meadows Ranch in March 2019. He will soon be available for adoption as a sport horse.